KARL LAGERFELD. MODEMETHODE – Ausstellung in der Bundeskunsthalle from Bundeskunsthalle Bonn on Vimeo. 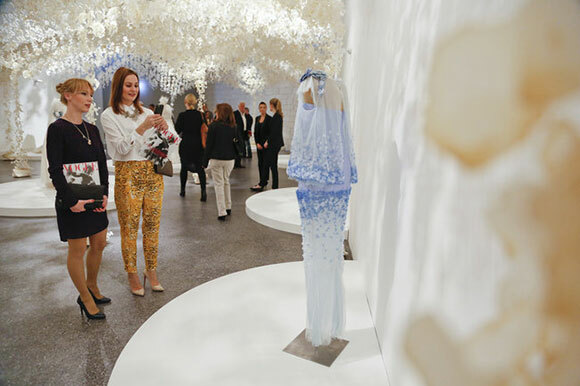 Paper art studio Wanda Barcelona have created yet another astonishing installation for «ModeMethode», Karl Lagerfeld’s retrospective now showing at the Bundeskunsthalle Bonn. 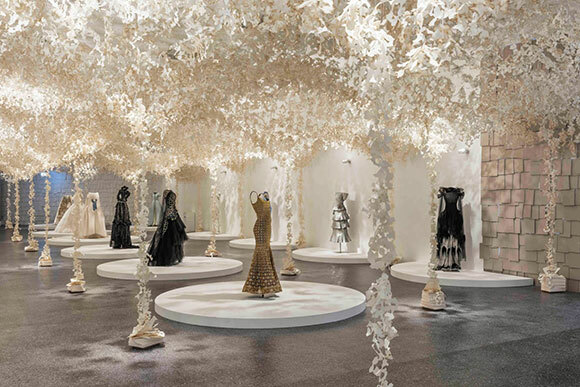 The exhibition is a fascinating journey through Lagerfeld’s body of work: it begins with a replica of the designer sketchbook-covered desk, where discarded ideas lies around as crumpled paper, and culminates in Wanda Barcelona’s 500 square meters paper palace that houses his Chanel Couture most emblematic pieces. 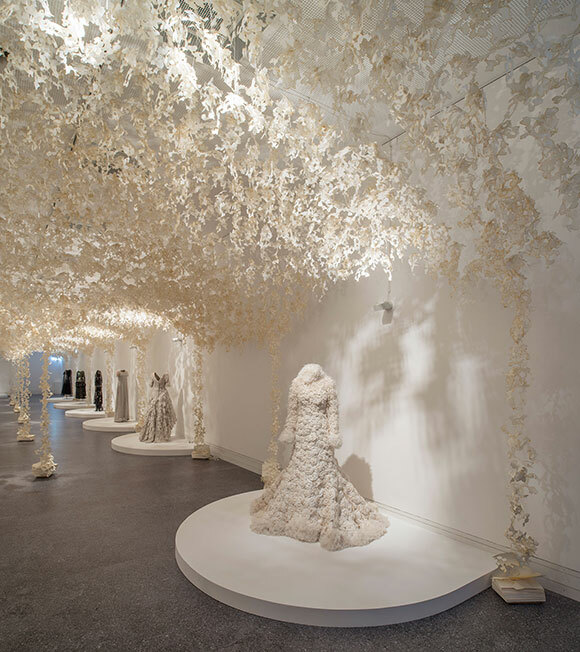 The palace is composed by precious floating foliage that seemingly pours in columns out of books positioned across the floor and required more than 15.000 laser-cut pieces of paper to create a three naves hall. 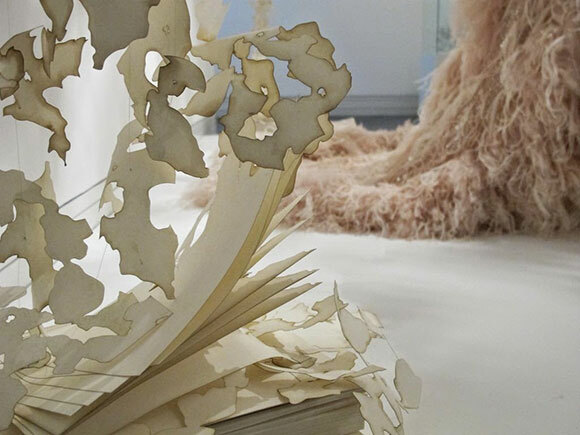 The paper’s delicate creamy hue and subtle burned outline elegantly compliments the beauty and craftsmanship of the couture creations and resonates of Lagerfeld’s modus operandi, in which every idea is drawn on paper and is either produced or discarded and incinerated. 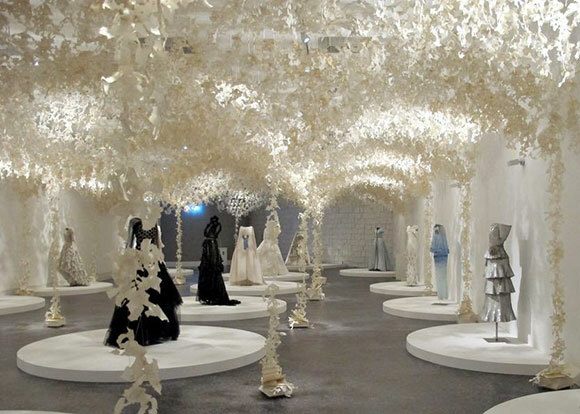 Created and executed in three weeks, the paper palace has been defined by Vogue as «paper couture installation» and it could be visited at the Bundenkunsthalle in Bonn (Germany) until September 2015. See more of Wanda Barcelona’s work here.